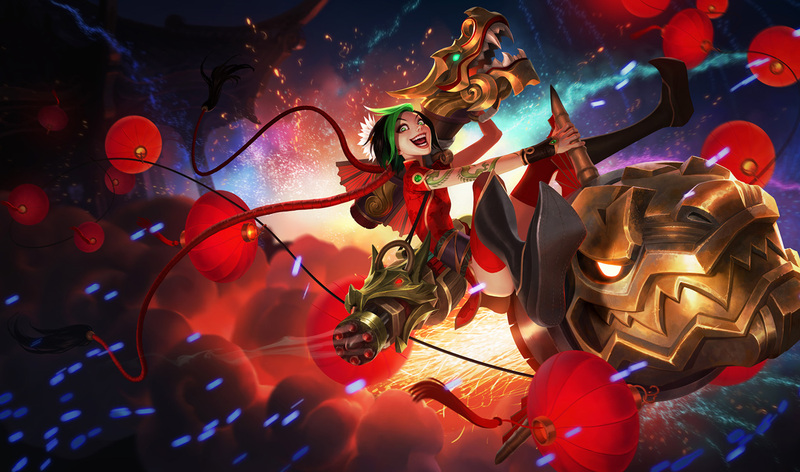 League of Legends‘ annual Lunar Revel event is upon us and with it comes the usual smattering of Chinese-influenced skins that edit the appearance of the characters in-game. 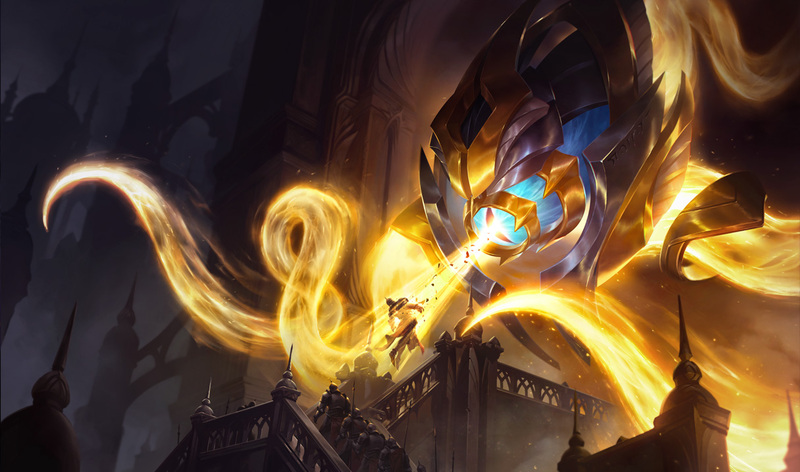 We took a look at the new event skins (plus a couple more) and judged whether each new skin was an upgrade or a downgrade from their previous look. Downgrade. I think his original design of spacey eyeball tentacle alien is tired. 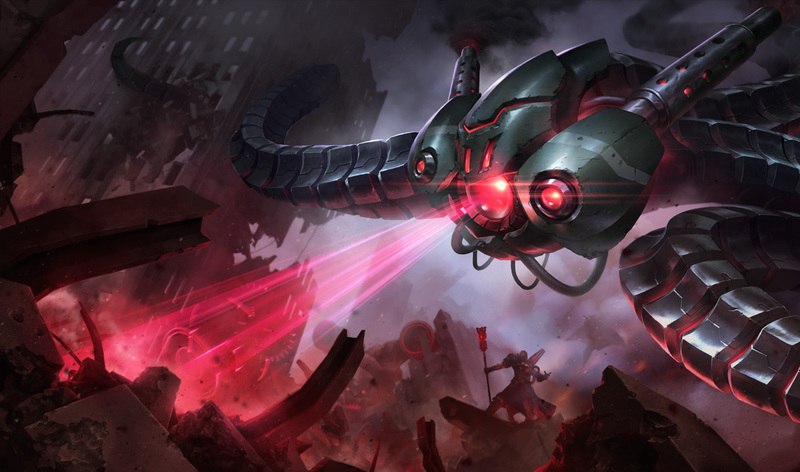 Battlecast Vel’koz spiced him up a little, but Arclight Vel’koz is basically a palette swap of the original skin. Yawn. 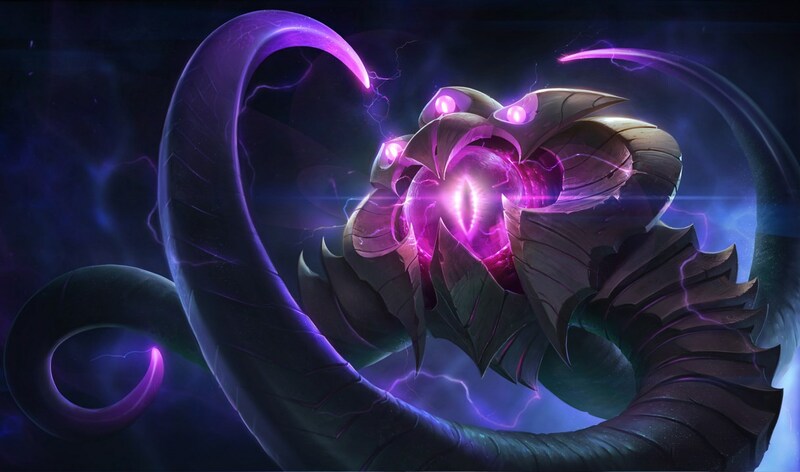 Vel’koz Classic looks like some kind of Little Shop of Horrors Audrey 2 spin-off, so already pretty horrifying. Battlecast improved on this by just covering him in armor, so impenetrable flower-demon. But I actually think Arclight is a further upgrade: it looks like part of the Sphinx broke off and is terrorizing modern day with eyeball lightning. How do you even deal with that? Yikes. Upgrade. 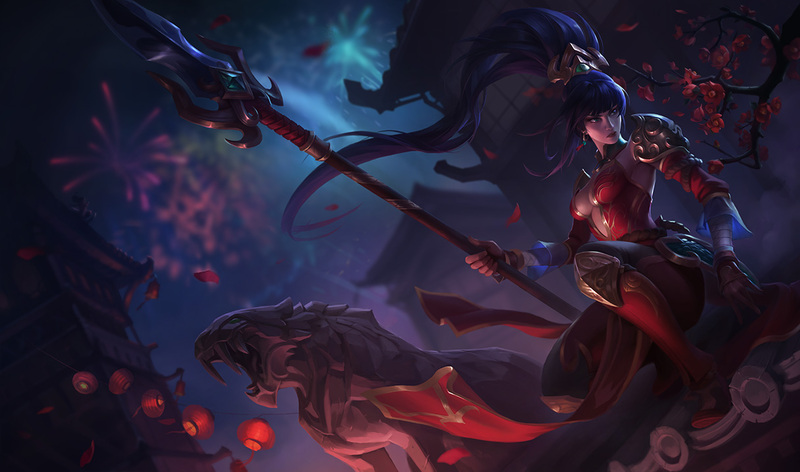 Warring Kingdoms Nidalee mostly wins due to the hairstyle. 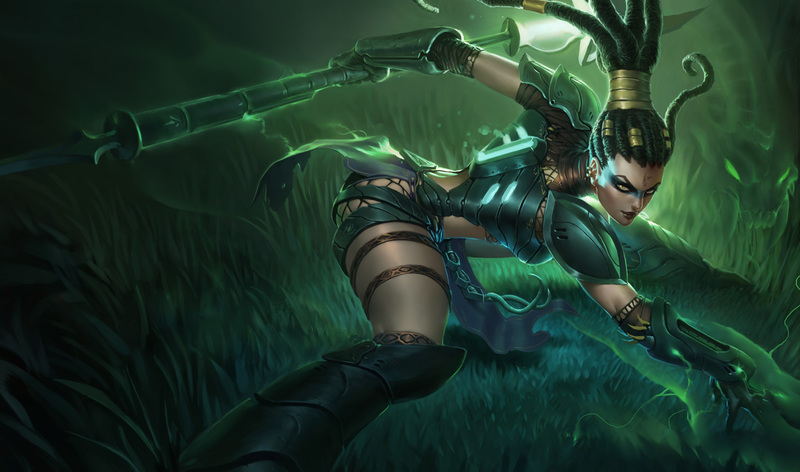 I know Headhunter Nidalee is supposed to be modeled after Predators and their weird alien braids, but it’s not a good look for them and it’s not a good look for Nidalee. Definite upgrade. I agree with Joey on the Headhunter hair. Some people can pull off dreads, but she is apparently not one of them. I like both outfits about equal–the insectoid armor platelets and the segmented samurai variation–so the hair is really the deciding factor here. Upgrade. 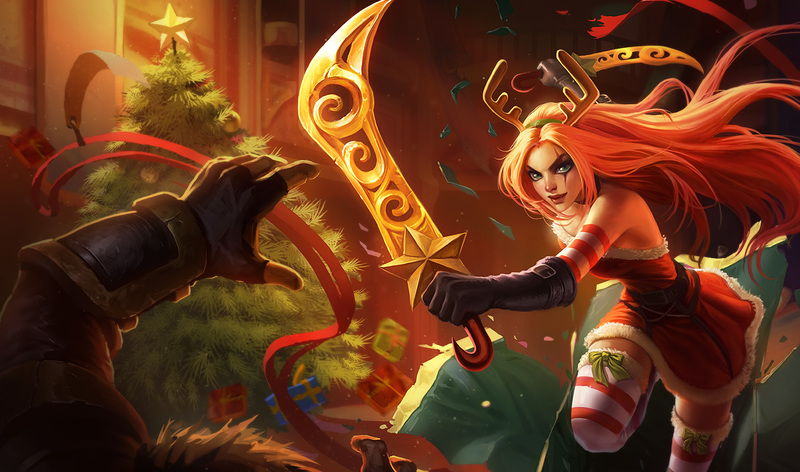 The Christmas-themed Katarina is almost good, but why did they give her orange hair when her natural red hair would have been perfectly Christmasy? Oh, god, upgrade. That Christmas one is too much. I think the reindeer antlers push it over the edge: possibly the least threatening accessory imaginable. Love the gold detailing on the Warring Kingdoms outfit, especially along her upper legs. This could almost be a Christmas outfit with the red and gold but, you know, a non-ridiculous one. Upgrade. It’s an elegant look, but still maintains that manic feel that Jinx exudes. 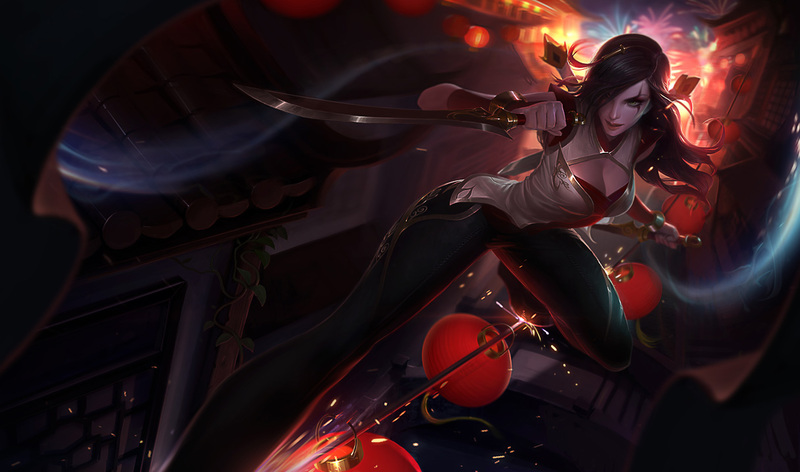 It’s an overall clean and cohesive look, whereas Mafia Jinx’s weapons/hat/attire clash in my opinion. Also she has a pearl necklace which will never be not-tacky to me. First, I don’t play League, but I assume this girl is insane? She has utter crazy-face in both of these. I’m going with ‘upgrade’ as well. 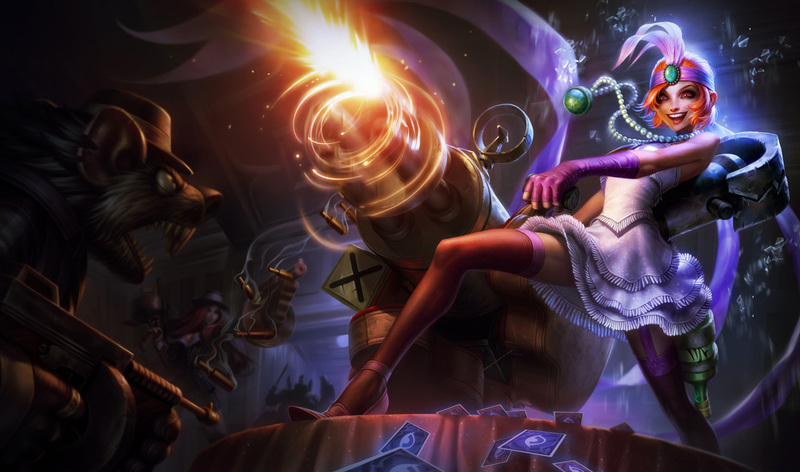 I love the flapper look, but Mafia Jinx is relying way too heavily on lavender. A little purple goes a long way, especially when your hair is bright orange. I love the full-arm dragon tattoo on Firecracker and the emerald accoutrements that provide pop without being over-the-top. I’d just recommend tights or a longer skirt if you’re going to wall-hang (or missile-hang) like that. Downgrade. 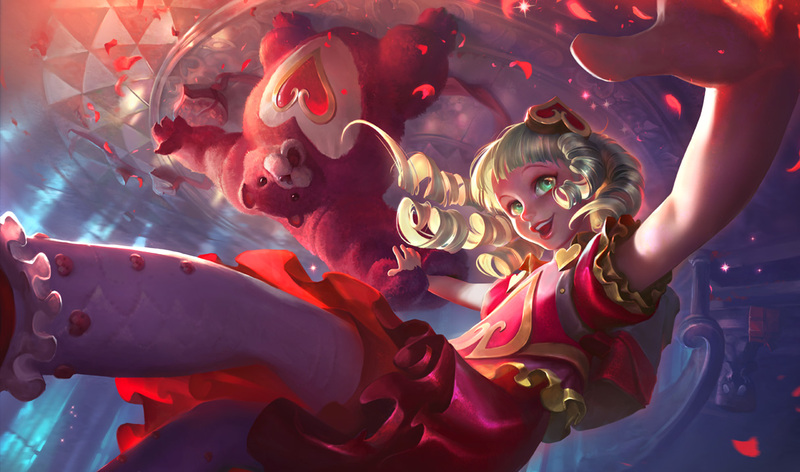 I’ve never been a fan of Carebears, which this skin is an obvious homage to. Annie herself is a bit mundane. I feel like the hearts are placed in odd positions as well; they should be complimenting the ensemble, not dominating it. 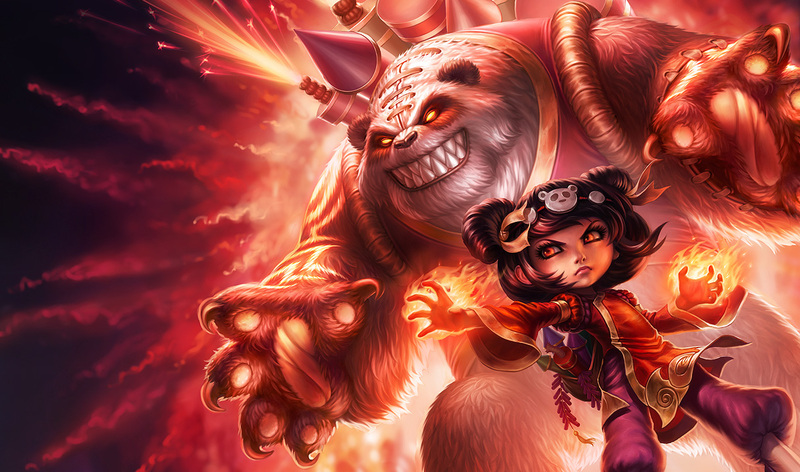 It’s not terrible, but I find Panda Annie more appealing. Possibly due to my love of pandas. Downgrade, ugh, ugh, ugh. This is just oozing dead-eyed-creepy-murder-doll. Way too many hearts as Joey pointed out, and way too many ruffles. She has ruffles on ruffles on ruffles. Panda Annie is a bit puffy for my tastes, but I love her panda-shaped hair and not-soulless-eyes. The panda, however, is horrifying and confusing: what’s with the straps on his head? Is he part football? Slight preference for Care Bear, major preference for Panda Annie. In Hot Take features, we give our first impressions of newly-announced characters. 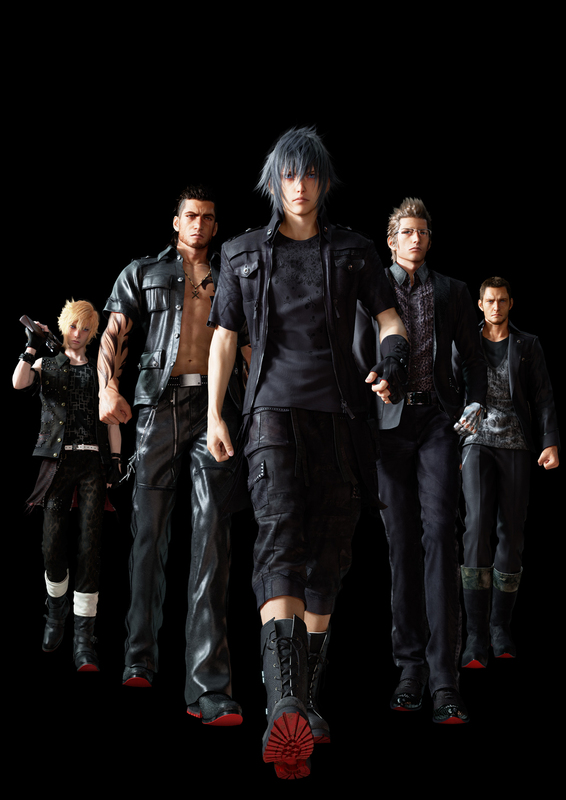 This week, we take a look at the main men of Final Fantasy XV that were confirmed at the Tokyo Game Show and are pictured below (from left to right): Prompto, Gladiolus, Noctis, Ignis and Cor. I love how as you move from left to right, the outfits get more and more subdued. As someone who was mocked by his friends from wearing long shorts (capris according to them) in college, I’m glad that Noctis is sharing my passion for cool breezy hamstrings but covered knees. I liked the patterned shirts on the right three, but the exposed shoulders in Prompto and exposed chest on Gladiolus kind of break up their gang-synergy. At least I’m assuming they’re a gang, what with their matching red soles and all. Gang or Boyband, I’m loving the coordinating getups. I think four out of the five are pretty strong. Ugly tattoos and top-to-bottom patent leather on Gladiolus is the weakest link here. Also want to note: Gladiolus is a pretty, pretty flower. The accessories are questionable, namely the quantity of fingerless gloves and the one pair of camo cuffed…cowboy boots? I’m hoping for his own sake, Ignis works behind the scenes. He looks like the guy they keep in the back of the van monitoring computers while everyone else is inside…opening safes? Roundhouse kicking people in the head? Glasses and hair like his don’t often get into quarrels and fisticuffs. I think we should go with “gang,” because this is a walking mass of Hot Topic shopping spree. Amazingly, they each managed to find about ten different items without doubling up on anything, although I’m sure a fight broke out over who would get Cor’s skull deep-V and Noctis’s fingerless gauntlet. Prompto has too much of a Daryl from The Walking Dead vibe, complete with punk-hillbilly vest and perfectly styled “messy” hair. Gladiolus is a mess of pleather as Erin mentioned, but I like his bonus giant crotch zipper. I’m not on board with Noctis/Joey’s flood pants, although he has the best boots of the group and is displaying them proudly. His pseudo-military dress shirt is also all business. Ignis is so stiff I think he might be a mannequin they stole from the store, so his playful leopard print blouse is a bit out of place. 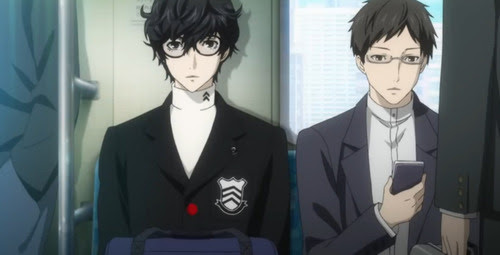 Cor’s elf-toed rain galoshes are just…no, but at least he had the decency to put an undershirt beneath that ultra-deep-V.
Sony and Atlus gave us a sneak peek at the protagonist for the upcoming Persona 5 this week, and it got our style snark flowing. Mostly because Joey is a huge Persona fan and insisted we talk about this guy at swordpoint. From what little I know about Persona, I assume he’s wearing a school uniform, and based on Erin’s previous (and accurate) assessment that “uniforms do not reflect personal style,” we’re a little bit limited in our judgements. The thing that draws my eye is the red splotch on his blazer: is this a single red button? A ketchup stain? A laser pointer indicating he’s about to be sniped? The vertical arrow stitching on his turtleneck seems to scream “Hello, my eyes are up here,” but don’t worry–I wasn’t ogling this boring black and white stodginess. I like his glasses but think he needs a hair trim: with that much mop, we lose the top of his frames and the bottoms end up looking like weird raccoon accents. Ask your seatmate where the nearest barber is, stat. As someone who wears glasses every waking minute, I can’t begin to tell you how much his hair annoys me. I want to brush it out of his eyes. It makes my forehead itch. Those lenses are 100% greasy, I’m telling you right now. As for his outfit, I also think it’s a uniform…and I think that school is Professor Snape’s School for the Sullen and Pasty. I must admit, as hyped as I am for Persona 5, I agree that this new protagonist isn’t doing much for me. 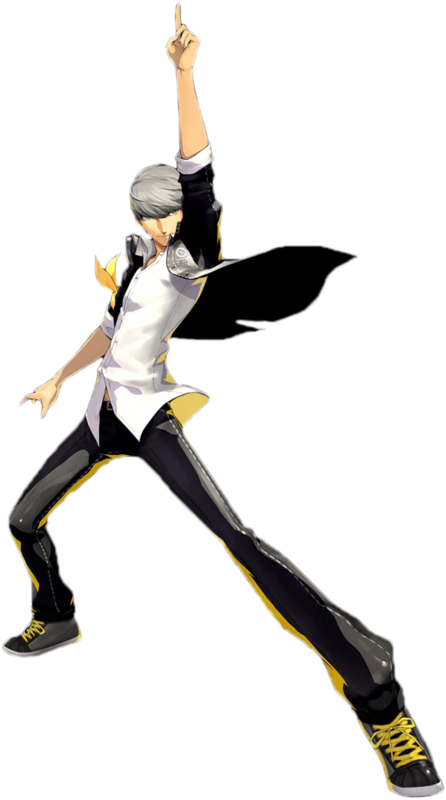 Persona 4’s protagonist exuded confidence. This new guy’s neatly-pressed, high-collared look and mousy hair somehow make him seem too insecure. Unless he is in biblical school to become a priest? I’m curious to see how the other characters rock the uniform and if they can make it work.